The Breastfeeding Community of Practice regularly shares information about ongoing activities, upcoming education and training opportunities, media coverage, local events and gatherings relating to breastfeeding. Martha Paynter is a Halifax Mom of two and is also one of our Breastfeeding Community of Practice members who knows just how important human breastmilk is for babies, especially babies who are medically fragile and whose own mother's milk is unavailable. Martha is one of four N.S. Moms who donate their breastmilk to the Calgary Mothers' Milk Bank as there is no milk bank in Nova Scotia. Once processed and pasteurized, some of this milk comes back to the IWK Health Centre to be used in their Neonatal Intensive Care Unit for the sickest of babies. The IWK has created a Milk Room, where they can receive donor milk to be stored, labeled and dispensed to babies by prescription, who fit certain criteria and whose parents have given consent. Providing these fragile infants with pasteurized human donor milk provides them with passive immunity and gives them a stronger hold on life. Martha would like other moms to know how easy it was to donate to Calgary Mothers' Milk Bank, and has created a 3 minute Youtube video on how to ship your breastmilk to Calgary. She is hoping to raise awareness on the importance of donating breastmilk to improve access to this lifesaving substance, when a child's own mother's milk is unavailable. 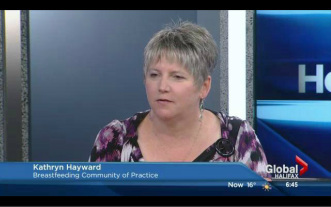 Kathryn Hayward, co-lead for our Milk Bank Working group was interviewed live on Global TV. Kathryn explains what a milk bank is, and why Nova Scotia needs one. Capital District Health Authority has taken progressive steps to become breastfeeding friendly. They have announced their new Staff Breastfeeding Policy which would support staff returning to work following a maternity leave who are continuing to breastfeed as well as new hires who are currently breastfeeding. Our own Laura Smith, was interviewed by Elizabeth Chiu, CBC. A Cole Harbour mother says she was told to leave a store in Mic Mac Mall because she was breastfeeding her infant daughter. Breastfeeding Advocates upset and plan to stage a nurse-in to create awareness. Claire's has since contacted the Mom to apologize and to state this was by no means a policy, but no public apology has been made as of yet. 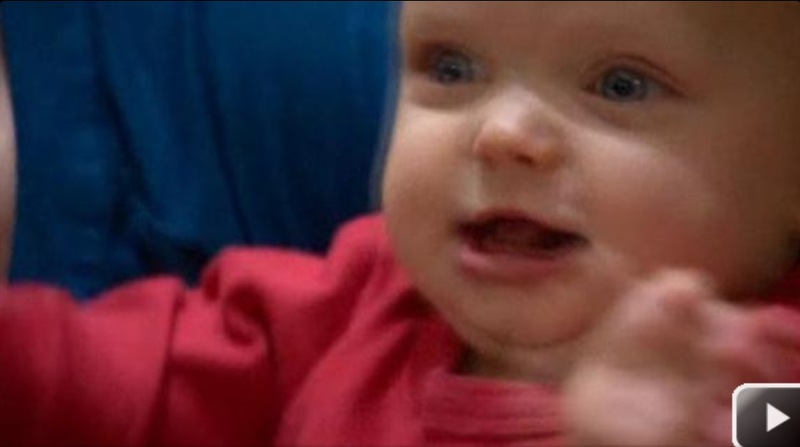 Babies don't pose food safety risk says Deptartment of Agriculture. The Department of Agriculture has apologized for the way it handled complaints about a restaurant owner breastfeeding while at work, CBC news has learned. "Babies in restaurants in and of themselves don't represent a food safety risk," read the statement. A Nova Scotia restaurant owner says customers complained about her breastfeeding, sparking a food safety investigation. at the Awards Night, Nov 1, 2012. Congrats!! Jacqueline Foster sits down to talk with Keely Fraser, Public Health Nutritionist at Capital Health to learn more about what the Breastfeeding Community of Practice is doing to promote, support and protect breastfeeding in Halifax Regional Municipality. 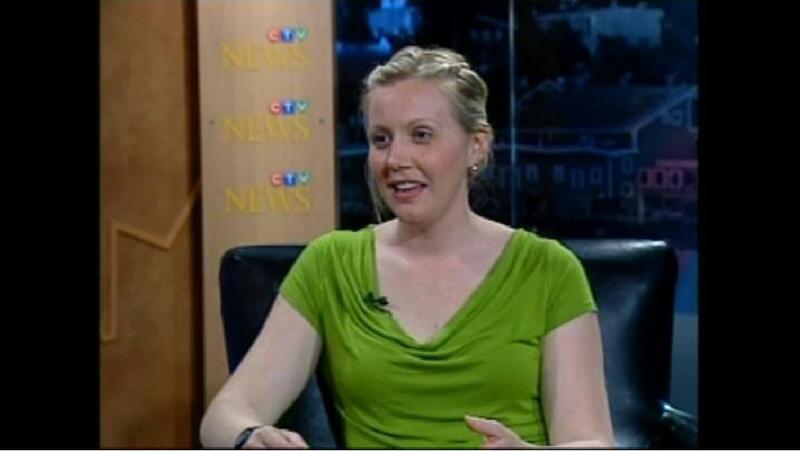 Keely Fraser, Public Health Nutritionist with Capital Health in Halifax, Nova Scotia. A group of women who share breast milk are hoping to see a more official arrangement at the children's hospital in Halifax. 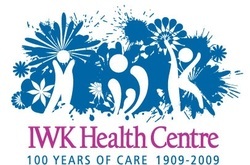 The IWK Health Centre had such a milk bank, but it was shut down along with every other one in the country after the tainted blood scare in the 1980s. Kathryn Hayward, a nursing professor at Dalhousie University, is chair of the milk bank working group. She envisions something like a blood bank for milk. To see the full story click here. Recently we teamed up with a group of students in the Applied Media and Communication Arts Program at Nova Scotia Community College, Waterfront Campus. As part of a term project students were tasked with creating a short video about breastfeeding. The students had total creative freedom and came up with this video that presents breastfeeding from a youth perspective. Grand Rounds feature a variety of interdisciplinary topics related to breastfeeding, including information on evidence-based research, best practice guidelines and supportive methodologies. Health care professionals at the IWK and in the community, as well as anyone who works to support mothers and babies, are welcome to attend.